500 H1 4-Stroke Engine w/EFI: Smooth, consistent acceleration comes courtesy of this potent 443cc, SOHC, liquid-cooled single-cylinder. Its wide torque curve and smooth power delivery are a benefit of electronic fuel injection, which tunes the engine for any temperature, elevation and humidity. Fully-Independent Suspension: In the face of aggressive terrain, 10 inches of travel, combined with 10 inches of ground clearance lets you consume every obstacle in your workday. Digital Gauge: The digital gauge features 14 critical operation information indicators: clock/hour meter, fuel level, mode button, set/reset button, odometer/trip, gear position, speedometer/tachometer, needle display, differential lock, high beam, temperature and oil pressure. Duro Kaden Tires & Aluminum Wheels: The all purpose Duro 3 Star Kaden tire is a favorite among the offroad crowd. It’s a go anywhere, do everything tire that gives you great grip and a great ride. These handsome aluminum wheels deserve nothing less. On-The-Fly 2/4 WD + Electric Front Differential Lock: Purists prefer to be in control of when to shift into 4WD. With the flip of a switch power is delivered to both the rear and front wheels via the open front differential. In 4WD steering remains light. When you need maximum traction flip the switch again to lock the front differential. 3-Passenger Seat: The Prowler® HDX™ is a working Side by Side. Sometimes the job calls for an extra hand. Which is why we added the three-person bench seat. Transformable Tilting Rear Cargo Box: The HDX™ was voted the industry’s best heavy duty ROV. The 2-in-1 cargo box hauls up to 600 lbs. It’s wide enough to fit a wooden pallet and converts to a flatbed in minutes. Front and Rear 2-Inch Receivers: You’re gonna be towing stuff. So naturally, we provide the receiver for your 2-inch hitch. And to make things even more interesting, you’ll find a second receiver up front. Now that’s clever. And useful. Underhood Storage: Underneath this Prowler® hood is a large 25-lb. capacity storage area. It’s a great place to keep those valuable high, dry and out of site. Side Storage Compartments: There’s no shortage of places to store your tools and toys. Check out these hidden storage areas located in the side wheel wells. Sleek Side Restraints: Nifty, huh? It’s all about ergonomics. Making sure you’re in there feeling good and comfortable. Electronic Power Steering: This model features variable assist electronic power steering (EPS). 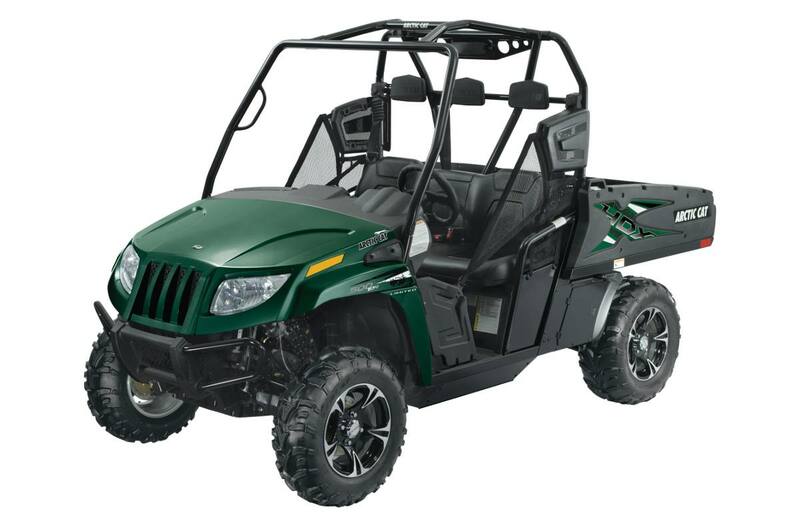 Arctic Cat® EPS activates automatically at the moment of ignition. Thanks to this advanced technology, steering your machine requires minimal effort even at rock crawling slow speeds. Automotive-Style Paint: Why do we give these machines such a nice paint job when all you’re gonna do is take it out and get it very dirty? The answer will hit you the second you hose off all that dirt. There’s nothing prettier. Dashboard Shift Lever with Park: Ergonomics on these machines are quite excellent. Here’s another example. The shift lever is right there on the dash. We’ve added the Park gear for the sake of convenience. No need to set the parking brake. But we recommend you do anyway, especially when parking on steeper grades. M-F: 9:00 a.m. - 6:30p.m. Sat: 9:00 a.m. - 3:30 p.m.